​How often do you really need to wash your beach towels? If you’re like 96.32% of Australians, your beach towel will spend more time rolled up damp in the back of the car this summer than hanging on your clothesline. Its scent will more closely resemble that of the ocean than the powdery freshness of your laundry detergent, and its surface will cultivate an interesting collection of sand from various beaches, turning it into a tactile diary of your summer. Sound about right? If so, it’s time to address your beach towel hygiene. Like any other towels, beach towels grow bacteria while damp. Unlike bath towels, which are usually only exposed to the everyday bacteria lurking in our bathrooms and on our own bodies, beach towels can pick up a much more exotic collection of organisms, like those found in bird poo (thanks, seagulls), food scraps and other peoples’ bio fluids (think snot, saliva and earwax). Yummy. So, if you dry yourself with a beach towel you balled up damp post-swim a few days ago, you’ll be transferring all this wildlife onto your skin. If there’s some bacteria in the mix your body’s not used to, chances are you’ll win yourself a new pimple, pink rash or mild skin infection. Now you know why you should be taking better care of your beach towel, let’s look at how you should go about it. While you don’t need to wash your beach towel after every swim (more on this below), you should get into the habit of drying it in the sun after every use. Why? The sun’s ultraviolet rays kill around 90% of germs, keeping your towel’s bacteria level within the healthy range. If it’s a cloudy day or you get home after sunset, popping your towel in the dryer will have a similar effect, killing off bacteria with a combination of heat and moisture removal. While an initial shake at the beach (ideally downwind of any fellow beachgoers) is always a good idea, make sure you go back for round two once your towel is completely dry. You’ll find the sand won’t stick to the towel’s surface like it does when the towel’s wet so you’ll have a much better success rate. It’s also important to get rid of as much sand as possible before you put your towel through the wash to prevent any rogue grains becoming entrenched in the towel’s fibres. As with bath towels, beach towels benefit from a proper wash after every third to fourth use to keep them at their bacteria-free best. While this is a good general rule of thumb, remember to wash towels earlier if they’re stained with errant sunscreen, seaweed or gelato, or if they smell funky. Cold water washes are the best option for your beach towel. They much less likely to imbed any left-over sand into the towel’s fibres, help keep colours true and bright, reduce any likelihood of shrinkage and are better at removing certain stains. You should also skip the fabric softener when giving your beach towel a wash as it can reduce both the absorbency and softness of the material. Finally, make sure you don’t overdo it on the laundry detergent. Using too much will prevent your towel from rinsing clean, leaving it a little soapy to touch. If you notice your beach towel is starting to smell, try soaking it in vinegar before you put it through the machine. Add one to two cups of white vinegar (depending on how many towels you’re soaking) to a tub of cold water and leave them to soak for at least an hour. Afterwards, put them directly into the washing machine as above. If you can still smell the vinegar at the end of the cycle, don’t worry: it dries clean, taking its distinctive smell with it. 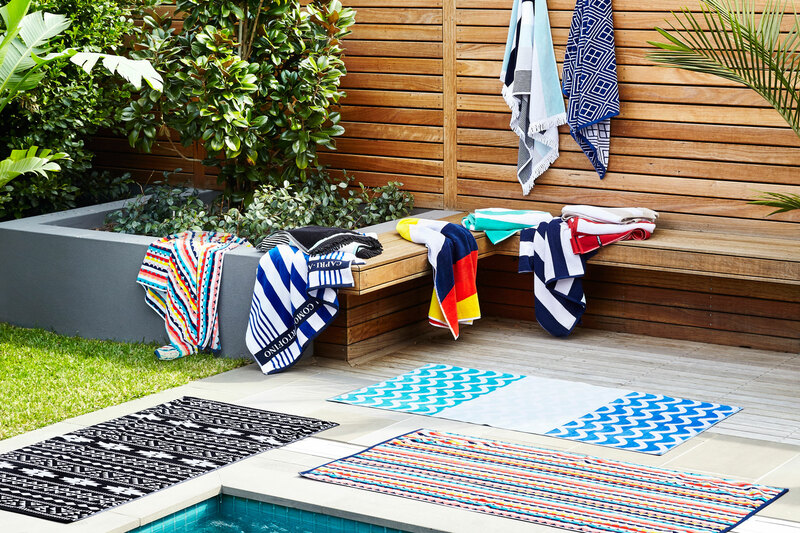 If your beach towel picks up a persistent odour that won’t go away with washing, it’s time to look at finding a replacement. The same goes for any towels with stubborn stains, rips, tears or well-worn patches that are rough on skin and reduce absorbency. Look for fast-drying fabrics, like cotton and terry towelling, and opt for a generous size so you can lounge on the sand or pool deck in comfort. Bright colours and bold patterns are always a good choice, easily capturing the fun and excitement of summer. If you are in the market for a new beach towel this season, check out our beautiful range . They’re all highly absorbent, soft on skin, generously sized and come in a range of beautiful colours and prints. Each design has been tested for shrinkage, linting and absorbency, and comes with a free 5 year manufacturing warranty. With all these great selling points, all you need to do is apply your newly acquired knowledge on beach towel hygiene and you’ll have fresh, fluffy towels for years to come.